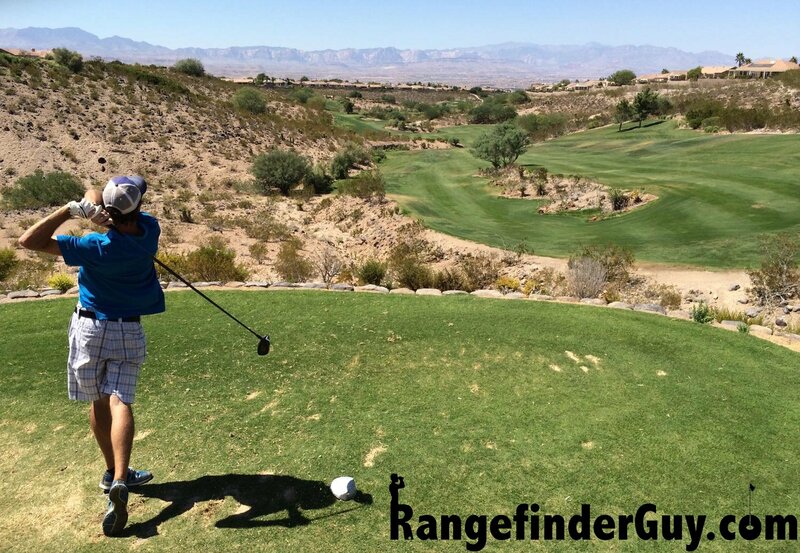 There is so much information out there about rangefinders, from online “golf rangefinder reviews”, manufacture specifications, and tons of suggestions for which product to buy. In my hundreds of hours of searching, I have found very few sites that actually put rangefinders through the test. The manufacture says a rangefinder is accurate within +- 0.5 yards, and everyone just seems to accept that as fact. I’m here to take a different approach on the golf laser rangefinder world. I spent a year with a rangefinder that was said to be accurate within +- 0.5 yards, but I remember a time where I was standing on the tee box of a par 3 and shot the flag with the latest pin-seeker technology. After a slight jolt of my hand, the reading came back at 141 yards to pin. I took a second reading just for fun, and to my surprise it came back at 144 yards to pin. After a 3rd reading I had distances of 141, 142, and 144. Now with my level of skill, these differences mean absolutely nothing. I’m lucky to be accurate within 5 yards when I swing a 9 iron anyways, but it did lead me to question just how accurate this +- 0.5 yard laser rangefinder is. I’ve decided it is time that someone puts the manufacture claims of golf rangefinder accuracy to the test. My goal is to put together a comprehensive list of the top tier, bottom tier, and rangefinders in-between to test claims of accuracy. I will do side-by-side tests to known targets from 40 yards to 225+ yards. We’ll compile the data that shows truly how accurate these things are. Along with testing for accuracy we will do a test of how quickly we are able to pick up the flag, how frequently we pick up background noise instead of the flag; we’ll review the size and usability of the devices, and give a general overview of the advantages and disadvantages of each unit. It’s time we find out if you really get what you pay for when it comes to golf rangefinders. The accuracy of laser rangefinders for golf is the reason I’ve created this site. Manufactures claim anywhere from +- 0.1 – 1 yard of accuracy from their units. I am going to put that to the test and see if how accurate they are from 40 yards all the way to 225 yards. I’ll do the legwork so you can make an informed discussion on real on-the-course tests instead of basing your decision on a sales sheet. I have no stake with one manufacture over another; we’re here to make sure you have the facts about your rangefinder for golf. Price is my second key consideration for your next golf rangefinder. I will be looking at rangefinders that can be had for less than $100 on amazon all the way up to $500+ MSRP rangefinders. You will finally have an unbiased test to show whether you really do get what you pay for when it comes to rangefinders. We will test mostly golf specific rangefinders with a few hunting rangefinders thrown in the mix. Is it really worth it to buy a rangefinder marked “Golf”, or will the lower cost hunting version do the same? We’re all about to find out! I’ll take a look at how far each golf rangefinder is supposed to be able to pick up an object, but I’m realistically interested in how well it can pick up a flagstick inside 250 yards. Most rangefinders can get measurements of 800 yards and beyond. Unless Happy Gilmore himself comes by the site and requests, I don’t plan on testing out any 400+ yard shots. I am a naturally shaky person and often have trouble picking up a flag outside of 200 yards with my current Bushnell Golf Hybrid Rangefinder. In testing, I will time how long it takes from the time the unit is picked up, to the time there is a reading on the flag. With pace of play being stressed so heavily, it is important that using a golf rangefinder doesn’t add extra time to your round. The goal is that it takes the guesswork out of your game, and in turn will actually speed up your play. Being able to make an informed decision quickly vs. searching for a sprinkler head, or walking off steps only to make an educated guess on the correct distance. A quick, accurate reading is what you need. Golf equipment should be made to last. When I purchase any golf equipment, aside from tees, gloves, and other misc. small items, I expect it to last for many seasons. Golf rangefinders should be no different. This is a purchase that should be well thought out, and expected to last 5-10 years minimum. I’ll take a look at the construction of the rangefinders, and what materials are used. I’m not going to be making attempts to break the rangefinders, but they will get plenty of on course time bouncing around in golf carts. It is important that the rangefinder you have fits your needs. Golfers who walk each round may be more concerned with the rangefinder size compared to those who ride in a cart. I ride most rounds, and personally like my rangefinder to fit into the cart’s cup holder. It makes it very accessible from both sides of the cart and it’s in a spot that I notice if it isn’t there. I’ll confirm that the manufacture size specifications are correct, although I don’t expect to see any discrepancies here. I also have many photos comparing units side-by-side, which is a much better indicator in my opinion than listing the dimensions of the item. There is a decent range of different zoom ratings and lenses sizes on golf rangefinders, but what do they really mean. I’ll take a look through the lens and get a side-by-side view with my own eyes. Rangefinders will be rated against each other instead of an online description. The optics from brand to brand can vary greatly. Beyond the lens size and zoom levels, there are other factors that come into play like lens color and display color/adjustments. It seems like this would be pretty standard across the board, but we’re really interested in how easy it is to use each rangefinder. Do you have trouble locking into a pin from outside a certain distance? Do you pick up trees in the background more than you pick up the flag? Does the rangefinder lock onto the flag and keep the reading? All of these factors will be listed in the ease of use category during our rangefinder reviews. I have also found that how firmly you have to press a button to get a reading greatly affects how easily you can pick up a flag. When you are straining ever so slightly to push the button you end up moving the device around. There is a pretty clear-cut answer to whether your rangefinder is tournament approved by the USGA or not. With the current rangefinders on the market, it all comes down to whether the unit includes slope adjustment, and whether that function can be made inaccessible during a tournament round. The most recent trend has been to provide multiple faceplate adapters for the rangefinder, one with slope adjustment and one with straight-line distance only. We won’t be making a big deal about the slope rangefinders, and while we will test a unit or two that include this function, we are focused on the straight-line-distance provided by the rangefinder. If you are interested in how slope is calculated, click here to see what is taken into consideration and to find out if it is important for you to have. We are here to take a hands-on approach to all of our testing and reviews. Nearly all of the websites related to golf rangefinders are strictly manufacture specs and images. We’re here for real world testing, not just copy-paste information that can be found everywhere. With that being said, there will be times where I will supplement my own findings with reviews from others online. I want to make sure that I am taking a 360° approach to give you the most informative reviews possible. If I find a review online where someone was having a specific issue that I think is worth mentioning or taking into consideration, I may add it to my write-up. I’d love to hear from you about what you want to see. Anything golf rangefinder related, any flaws you think I have in my testing, your personal opinion on a rangefinder, or anything else you think I need to here. Send me an email to tj@rangefinderguy.com and I’ll try my hardest to get you taken care of. Be the first to get new rangefinder news! DISCLAIMER: RangefinderGuy.com is owned and operated by TJW LLC which is a participant in the Amazon Services LLC Associates Program, an affiliate advertising program designed to provide a means for sites to earn advertising fees by advertising and linking to Amazon.com.